Gravitational lensing is a well-known effect where the mass of an object such as a galaxy deflects the light from more distant objects. It was first observed by Arthur Eddington in 1916, and affects the observed position stars. With distant quasars it can produce an effect known as an Einstein cross. Even dark matter can gravitationally lens distant objects, which is one of the ways we know of its existence. But where gravitational lensing would be the strongest is in the vicinity of a black hole. A simple black hole lens model. The gravitational deflection of light by a black hole has been studied for a long time, and there are many artistic rendering of lensed black holes. Such images are usually based upon the most simple of cases. That is, a single, non-rotating, stationary black hole. This simplifies the calculation of light deflection, since the gravitational field of the black hole can be considered static. Calculations also typically consider only the weak deflection of background light. Stronger deflections are more difficult to calculate, because you can have multiple paths arrive at the same point. For example, light can be deflected completely around the black hole before being lensed toward an observer. Taking this kind of thing into account can get really messy fast. Ray tracing light near a binary black hole. With the advent of powerful computational methods, has become possible to render more complex lensed images, and a new paper on the arxiv does just that. In the paper, the team uses ray tracing methods to calculate the lensing effects for both rotating and binary black holes. Binary black holes the lensing effects are particularly complex. Light takes time to travel, and close binary black holes move at a pretty quick pace. So the team had to model both the motion of the black holes and the dynamic path of light rays. 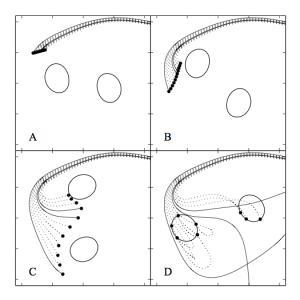 The results show a complexity of lensing not calculated before. One interesting result is that the lensing of close binary black holes resembles that of single black holes from a distance. Only under close observation are binary lensing effects seen. The paper has images of several examples, so it is worth checking out even if you’re not interested in the minutia of general relativity. 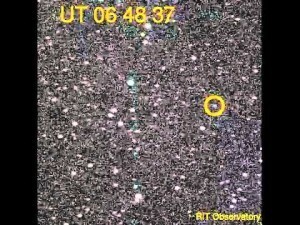 Strong lensing effects such as these aren’t likely to be observed in the real universe any time soon. Current technology doesn’t have the resolving power to image distant black holes at this scale. Also, the paper only considers the effects of the black holes themselves. In the real universe dust and other debris will affect the light near the black holes as well. 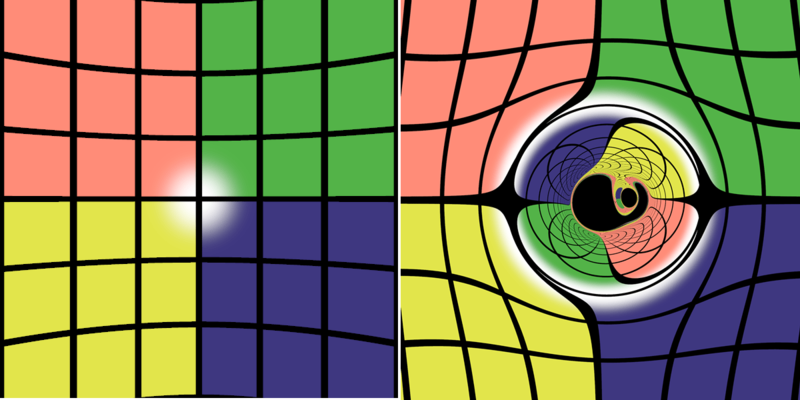 Still, it’s interesting to see the complex ways that black holes can warp and weft the light around them.